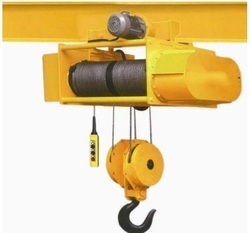 Manufacturer of a wide range of products which include wire rope hoists. We offer a wide array of high class Wire Rope Hoists with capacities ranging from 0.5 to 50 ton. These Wire Rope Hoists are 100% safe and are provided with electromechanical conical disc type brake which makes them the most exclusive hoists available in the marketplace. Having attractive operational features, these products are appreciated by our all clients.